Located in the harbour area, a district of innovation and one of the most prosperous emerging areas of the new Boston, is Hotel Envoy. The hotel is an equal combination of originality, hospitality and a modern touch, which has kept up with the pace of the North American city of Boston. The architect of this project was the Add Inc/Stantec, studio, and the common areas and the 136 rooms and suites were designed by Group One Partners, who chose the compact mineral from PORCELANOSA Group for the high transit areas of the hotel. We can find KRION® in the reception with an organic form which evokes a bridge sculpted by nature. It is the perfect balance between the stony appearance of our 1100 Snow White colour and the thermoforming property. 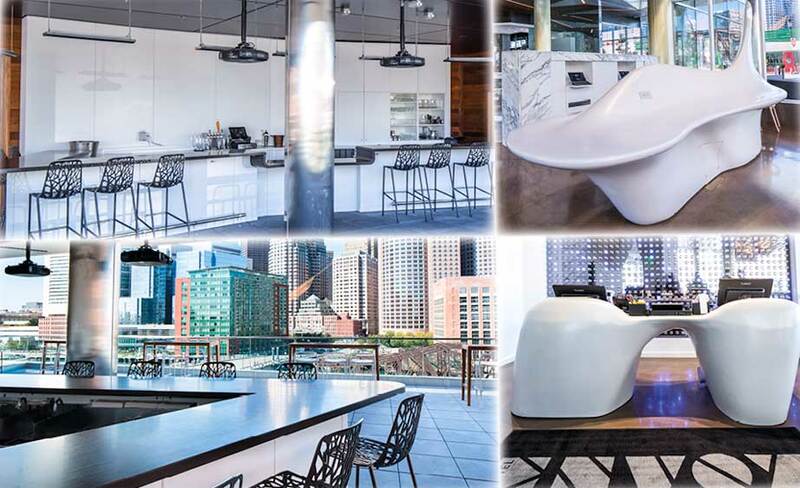 The rooftop bar located on the terrace gives great views of the area and has a bar made from 9507 Taupe Concrete, belonging to the KRION® Royal+ series. The doors, and also the wall which is used for the projector screen are also finished with sheets of 1100 Snow White. Finally, it is the furniture which attracts the most attention, with a futuristically shaped side table in the hall, reminiscent of a cetacean, which could easily be a creation of Herman Melville. Hotel Envoyis an experience worth visiting.